This is my son. This is my son eating playing with his food. I gave him some small bits of banana, and like always, they ended up nowhere near his mouth, smeared all over his tray and the floor. Had I followed the advice of most parenting books, he should be eating by now. We would've started with rice cereal and progressed from there. But because of my gluten intolerance and the likelihood that he will have trouble digesting grains, we're going a different route: starting with bananas, avocado, and sweet potato. He seems interested in all of them, but as soon as they touch his tongue, he grimaces and gags it out. He's still 100% breastfed and (obviously) growing well, so I'm not worried a bit that he's only had 3 tablespoons of food in his entire life. But I wish you could see the concerned faces of many a fellow mother when I tell them that he's almost 8 months old and hasn't had rice cereal. It isn't just about food. Young and old mothers alike have opinions when it comes to diapering and sleeping and disciplining and the like. If you're a new mom, this isn't news to you. You've probably been bombarded by advice laced with good intentions, but it still leaves you feeling like you aren't doing things quite right. But did you know there are no hard and fast rules when it comes to mothering a child? That's the sweet lesson I'm learning these days: there's so much grace. There's a mother's God-given intuition. There's a lot of prayer. For believers, there's the Holy Spirit who guides us in how to parent our children. Not our neighbor's children or our sister's children or children in the nursery at church. When I read Grace Based Parenting by Dr. Tim Kimmel a few months ago, there was one insight that has freed me in parenting more than any other. Proverbs 22:6 is often quoted in regards to parenting, and rightly so: "Train up a child in the way he should go, and when he is old he will not depart from it." This verse is often applied to say, "Teach your children about God, pray with them, and make sure they never miss a Sunday at church... and when they are older, they will know God, pray, and never miss a Sunday at church." But that, according to Dr. Kimmel, is not what the verse actually means. In the original Hebrew, that verse can be more accurately (and much more richly) translated, "Train up a child in the way he is going" or "according to his unique inner bent." In other words, listen to your child. Know the uniqueness of your child. Appreciate that he has been preciously, divinely created by God to be one of a kind - and that he should be parented that way. Trust that God didn't make a mistake when He created your child to like certain things or behave in certain ways. That thought has been more freeing in my 7-month journey as a mom than any other. Liam is unique. Precious. And while I could easily get frustrated when other moms question why he isn't eating rice cereal (I write that and think - aren't there bigger fish to fry?! ), I choose to love Liam deeply for who God created him to be. I commit to him to try not to compare him with other children - even other children of my own. And I believe that if he knows full well that he is loved for who God created him to be, I have mothered him well. He is adorable and such a happy child! :) He will be 1 year old this year? right? I remember I was chocked to see your post about his birth.. it was wonderful! Whitney, Liam is healthy and happy. 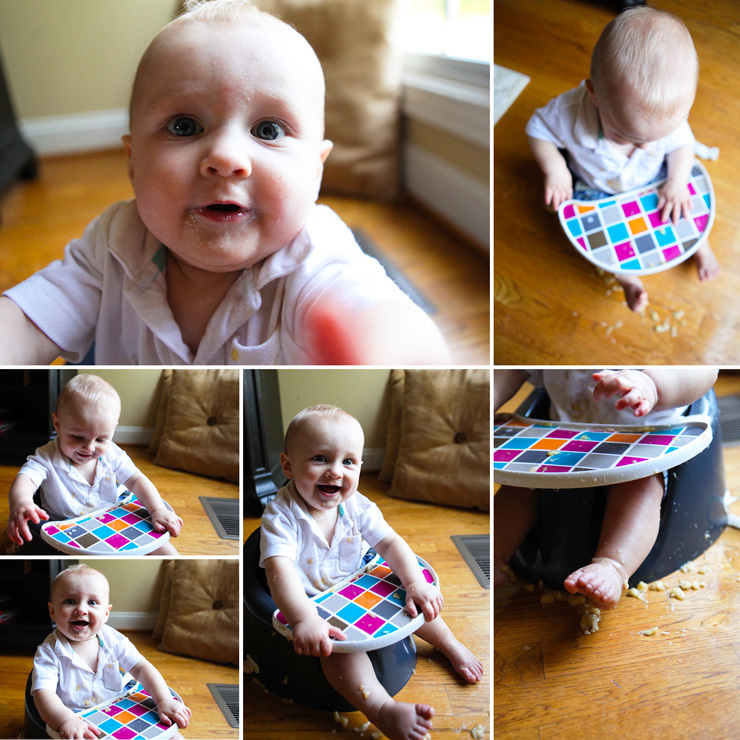 I did not feed my son any "cereals" until well past his first birthday. We were living in Munich when he was born, the Germans do not believe in feeding cereals to babies, it is too complicated for their little digestive systems ~ Zachy's first food was steamed mashed carrots when he was around five or six months old, I breast fed exclusively as well and wouldn't have done it any other way. Follow your heart, not only is he getting the best food ever, there is a closeness and time spent together that is beyond all measure. Treasure this time, it will be gone in the blink of an eye. Wow.... i love this post (even being a not-yet mother) I think it echoes exactly how I feel about parenthood! Thanks a lot! Yum! Avocados?! What a lucky baby! Looking at the nutritional values of regular rice cereal (equivalent to paste, really..) I'm never sure why rice cereal is pushed so hard anyway! You are such a great momma, I love your grace filled parenting ideas! Don't fret! My son just turned 14 months and most stage 3 foods make him gag. It was 11 months before he ate stage 1 and only last two months have we gone to three feelings a day. He's giant sized too. Wears 2/3 y.o clothing and 28lbs. He didn't crawl until 11 months. But he's perfectly healthy and happy, and seriously rice cereal isn't THAT good for a little one. I offer stage threes often to encourage and it's so much better. He was bottle fed breastmilk too. Just showing you, you're not alone. It's hard not to compare, I know but they'll eat eventually and probably, like teenage boys do, eat us out of house and home. So well said sis. So well said. My 10 month old has never had baby rice/baby cereal nor any purees of any kind. She eats normal food - avocado, sweet potato, everything healthy that we eat, in its customary form (not mushed). I have never forced her to eat anything. I think you have totally the right attitude in allowing Liam the space to deal with this new food thing in his own time and I'm sure he'll be be eating before too long. In the meantime, breastmilk is pretty super stuff! I LOVE this! It seems like every parent thinks (or is at least tempted to think) that they have The Right Way of doing things. I think that it's a way of overcompensating for the out-of-control, I'm-doing-the-best-I-can-but-don't-really-know-what-I'm-doing feelings that inevitably crop up when we suddenly have another tiny human dependent on us! 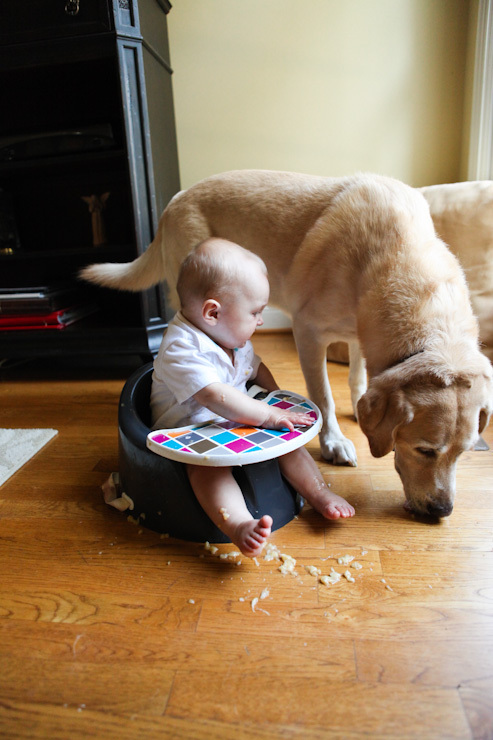 Baby cereal is certainly not the only way to go. I like that approach. I'm not a mother but that seems reasonable. Why force your kid to do what the parenting books say they should be doing at a certain age? I'm no doctor but I'm pretty sure as long as they're verbal by a certain age and interacting with their environment, they'll get to the rest of it in their own time. Beautifully said. Hopefully God will bring this post to my mind in future tears when I'll need the encouragement. I'm not a mother but my mother said I was eating solids @ 8 months but she also says that not every baby is the same and while I was eating all those things at 8 months I stopped eating all vegetables, fruit and red meat around my 2nd birthday and only in my teen years have I begun re-trying everything. I still don't eat red meat or cooked vegies and I only eat apples (it's a soft food texture that I don't like) and I am perfectly healthy and happy only eating fish, chicken and minced beef along with fresh vegies that most kids don't eat like spinach, radish etc. I really wouldn't worry about what others say, he is your son and at the end of the day no-one has the right to tell you how to raise him! Good Luck, your boy is just beautiful! I don't usually comment, but this hits close to home for me. As a new mama myself (only almost 4 months in! ), I've been encouraged by your parenting posts, especially in the times that I'm sorting through well-intentioned (but often unsolicited) remarks that have the power to leave me feeling "less than" if I let them. I'm so thankful for godly wisdom and counsel, and I've become even more grateful for people who offer it without implying that I'm a bad mom if I don't do exactly what they did. Praise God that he made us all unique and uniquely "perfect" to raise the children he gives us - it's freeing to remember that He has charged US with raising our little ones and will supply the grace and wisdom that we need to do so. You are doing GREAT! Liam is amazing! Ah, rice cereal...the box that took up space in my pantry because my I didn't want to give it to my babies and they didn't want to eat it. And yet, I bought it because I was supposed to, felt the pressure for sure. Such a good post full of wisdom. Love Tim Kimmel's book. You are doing a wonderful job with Liam. Food issues can be tricky, and you have every right to be cautious with your history of food allergies. A mom at the pool last week was shocked that Evan has never had any cereal. 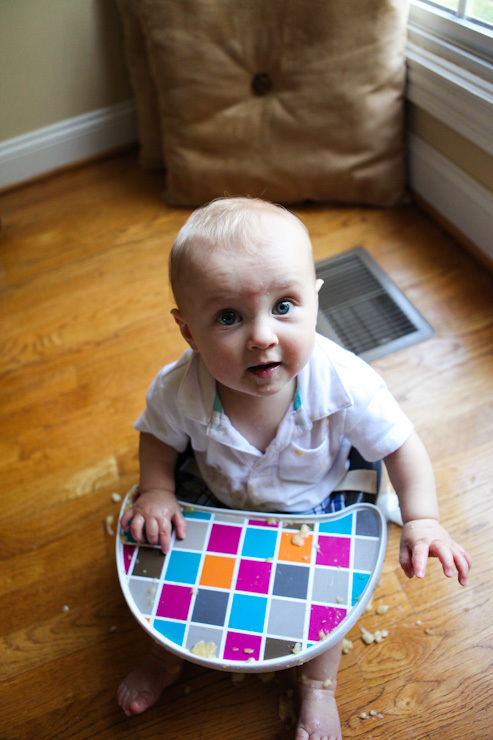 We are skipping cereals and purees and doing the baby led weaning route. Have you read the book? It sounds like you are naturally taking that approach with Liam. You might find it to be a helpful resource. Thank you for your honesty and transparency with your posts. Sometimes as mommas we need to hear the "real life" stuff from other moms! Such an interesting and wonderful interpretation of that verse... I had never heard that before! Thank you for sharing. So proud of you for being the mom you feel your little boy needs you to be, and nothing more or less! You're a wonderfully unique treasure to your family as I know you feel both Shawn and Liam are to you, keep being YOU! And, continue to let your little boy be himself! Love ya Roomie!